Dr Nikolas Tsakos responds to Professor Grammenos&apos; lecture by looking at the international industry and Britain&apos;s place in the market. Dr Nikolas P. Tsakos is the Founder, President and CEO of Tsakos Energy Navigation (TEN) Limited, a pioneering company which is the longest established Greek shipping public listing. TEN owns and operates one of the youngest fleets in the world with 65 tankers of 7.3m dwt, consisting of a modern diversified fleet of conventional and ice-class environmentally friendly vessels covering LNG, DP2 Shuttle tankers, VLCCs, Suezmaxes, Aframaxes, Panamaxes and Handysize tankers. Dr Tsakos comes from a traditional Chios seafaring family. He has been involved in the maritime industry since 1981 and has spent a total of two years at sea. From 1982 to 1985, he was Shipping and Operations Manager of Tsakos Shipping and Trading Ltd in the USA with a focus on the off-shore energy sector in central America and the U.S. Gulf. He received his BA Degree in Economics and Political Science from Columbia University (New York) in 1985 and his Masters Degree in Shipping Trade and Finance from the City University Business School in London in 1987. 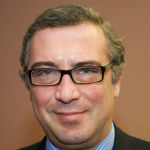 Dr Tsakos served as an officer in the Hellenic Navy in 1988. Dr Tsakos was awarded an honorary doctorate from the City University Business School in 2011, for his pioneering work in the equity financial markets relating to shipping companies. Moreover, he has received the following various awards: "Lloyd's List award for the Best Tanker operator in 2006", "EUROPE's 500 award in 2005, "Lloyd's List award to HELMEPA for achievement for clean and safe seas in 2004" and "Best Maritime Manager of the New Generation" award by the magazine " Business Administration Bulletin" at the Academy of Athens. Dr Tsakos is the Co-Founder together with Cpt. Panagiotis N. Tsakos of the Maria Tsakos Foundation (named after his late sister), a charitable organization for the well being and education of young, talented men and women focusing on maritime studies and tradition.